Category: $2,001 - $5,000, Combination Poly/Glass Greenhouses, Feature Greenhouses On Sale, Free Standing Greenhouses, Single Glass Greenhouses, Traditional Series, Traditional Series - On Sale, More.. This Victorian traditional glass greenhouse is an architectural delight, it is sure to create a stunning focal point in any garden setting. 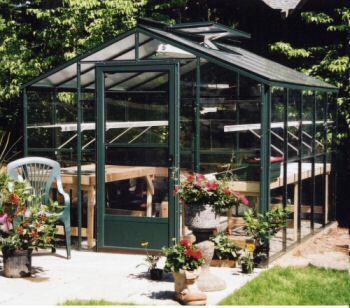 This traditional greenhouse is designed to offer the maximum natural light for year-round gardening. This feature tempered glass greenhouse is considered one of our Best Buys! It has been designed and constructed to the highest engineering standards for over 50 years! Height to center peak is 7' 81/4"
Decorative Victorian Trim Package is not included and is optional for an additional fee of $470.00. You may select this item for the Options shown at check out. Photo shown may not be actual size.